Our Work — Precision Safe Sidewalks, LLC. Precision Safe Sidewalks offers a fast, clean, compliant, and cost-effective solution to help you stretch your budgets and better allocate people resources. Sidewalk trip hazard removal is frequently reactive for multiple reasons. Complaints or incidents are oftentimes the reason sidewalks are repaired. Budget constraints and limited people resources often contribute to sidewalk repair being reactive. Proactive sidewalk repair and restoration is possible using precision concrete cutting. Contact us today to arrange for a free demonstration of our precision concrete cutting solution or estimate on our trip hazard removal services. This repair included a 1-1/2" trip hazard on a 7-foot sidewalk panel and a 2" trip hazard at a point of egress at the curb. 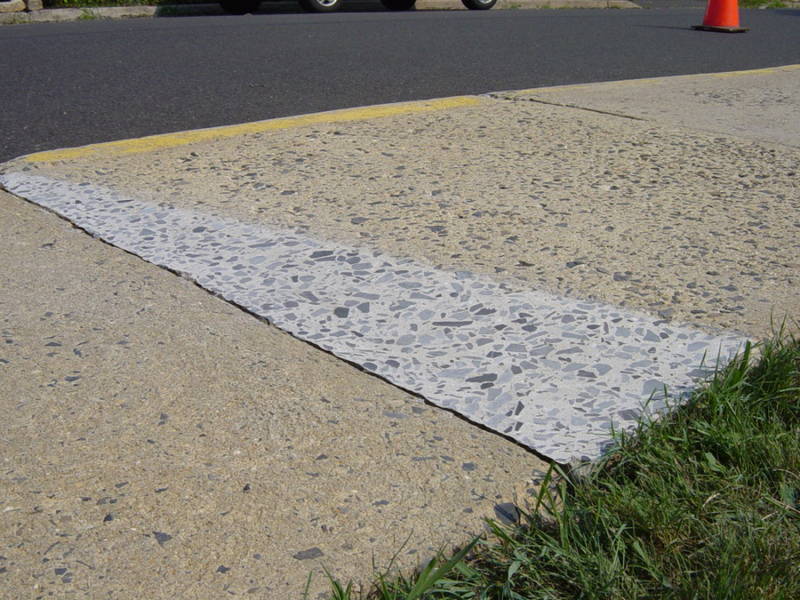 Curb: Repair made to include a beveled edge, maintaining consistency to previous curb design. OSHA compliant coefficient of friction for slip resistance. ADA Compliant: Trip hazard repaired at a 1:8 slope. These repairs are on a handicap ramp and entrance area around an intersection light pole. These sidewalk trip hazards present an increased problem for public works due to their high traffic location and vicinity to surrounding municipality assets. This three-panel repair was next to a light pole. All sidewalk repairs were made without any damage to the adjacent light pole and grass lawn. This is a side view of a sidewalk repair to a 1 1/2 inch trip hazard on a five-foot sidewalk panel.